Windblown! 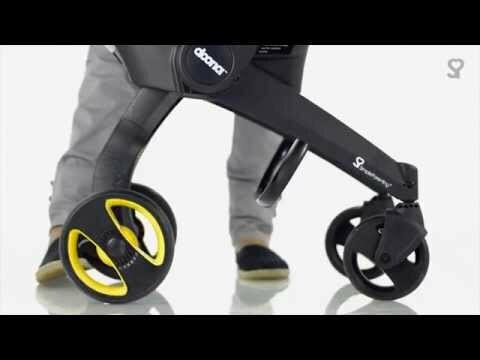 Doona makes parents life so much easier! How simple is it to go down the stairs with your stroller? How simple is it to climb the stairs with your stroller? We guarantee that the Doona Car Seat has been manufactured in accordance with the European safety standards and regulations, and is meeting the highest standards of quality. As proof of purchase, we ask that you fill out the Warranty Card and retain it for the whole term of the warranty period, together with your sales receipt. In the case of a warranty claim, the Warranty Card must be returned together with the product to your local distributor. Please also register your Doona Car Seat online. Natural signs of wear and damage resulting from excessive stress. Damage resulting from inappropriate or improper use. When the product has been used for a purpose other than that provided for in the instructions for use. In the event of a warranty claim, please contact us directly at customerservice@cuddleco.co.uk. Safer to use in a taxi, friends car, on the bus, tram, train or plane when your pram and cot are in the boot or stowage. Ease of use for the school run or popping to the shop. Like all infant car seats, Doona™ is not intended for the baby to be in all day. Similar to a lie back new born stroller, the angle of the Doona’s™ orthopaedic back rest and padding, coupled with the shape of the shell provides maximum comfort and safety for your infant, with a previously unattended level of convenience and flexibility. Safety was and is our #1 concern and will continue to be so. The Doona is here to help make parents day to day life more safe and simple. What is the Newborn Infant Inset and what is its purpose? Free with every Doona™ is the Newborn insert that has been developed to provide a near flat ergonomic position for your baby and ensures the neck and spine are aligned in an ergonomic position. The Insert has been designed to be used from birth onwards and can be removed from around 5lbs (11KG) onwards to ensure comfortable growth. How much does the Doona™ weigh? The Doona™ weighs 6.5 kg, which is lighter than the current heaviest car seat. 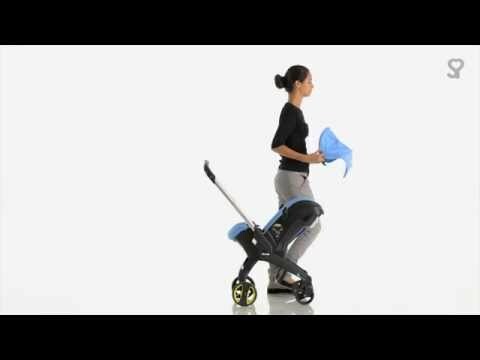 Uniquely, the Doona™ only requires to be lifted it in and out of the car as the integrated wheels can be unfolded and convers the Doona™ into a push-along stroller. The Doona™ is suitable from birth – approx. 15 months (13kg). What car seat Group is the Doona™? The Doona™ is a group 0+ rear-facing car seat. Is the Doona™ rearward or forward facing? 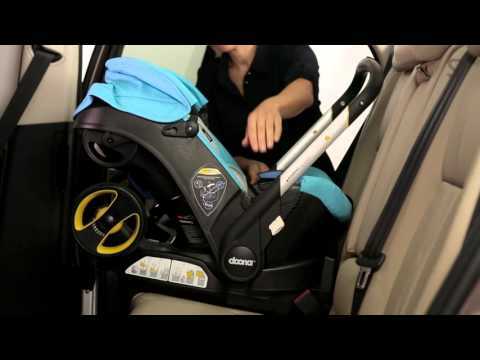 The Doona™ is a rearward facing car seat. It is recommended that you should keep your baby in a group 0+ rear-facing car seat for as long as possible as this is the safest way of transporting your baby in the car. You should only move them onto the next car seat once they have reached the weight limit of that seat, or the crown of their head is level with the top of the car seat. Can I still use my Doona™ if it is broken? We recommend that you should not use your Doona™ if any components are broken or missing. 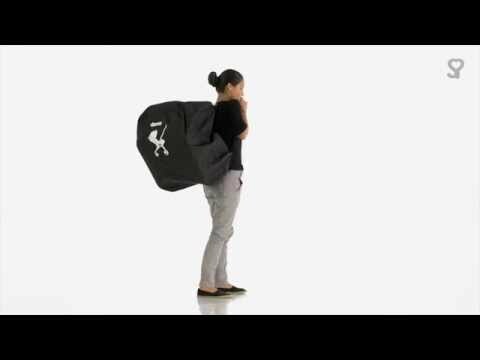 How can I contact Doona UK? Our Customer Services are open from 09:00 – 17:00, Monday – Friday. You can contact us via email using customerservice@doona.co.uk or via phone on +44 (0) 161 702 5063. For more information watch the How To Use video. Can i keep using my Doona after a car crash? In the unfortunate case of a car accident, an infant car-seat might be subject to powerful forces. These forces might compromise the car seat’s integrity and reduce its effectiveness in protecting an infant in the car. Since we have no way of precisely assessing how an accident might have affected the car-seat, and since the damage might not be visible, we cannot determine if any meaningful damage to the Doona occurred. Therefore, you should not use the Doona after it has been involved in a car accident. Is it safe to use a second-hand Doona car seat? NEVER put your child in a used infant car seat unless you know its history. A seat may be damaged or have been in a severe crash and have damage that is difficult to see. Why Simple Parenting chose a 5 point harness? Simple parenting believes that a 5 point harness better protects a child in case of an accident. In case of an accident, forces are transferred to the car seat and to the child. The child’s rigid body parts (shoulders and hips/pelvis bone) can withstand the high load forces of a crash better than the soft body parts (lower abdomen). With a 5-point harness the child’s abdomen area is better protected and do not have to endure high loads. The shoulder straps can be easily adjusted to the correct shoulders height, which ensures that the forces applied in an accident are best transferred to the car seat shell and the rigid shoulder bones of the child. In addition, in case of an accident a child might be injected from the car seat, the 5-point harness ensures that the child is well secured and keeps the child in the safest position within the protective seat shell. How does the Doona Side Impact Protection work? How to use the breaks of the Doona? The rear wheels are fitted with a braking system which allows you to use just one pedal to control both the rear wheels. To apply the brakes, press the red brake lock pedal located next to the right wheel. To release the brakes, press the green brake release pedal located next to the left wheel. The brake must always be on when putting the child in or taking him out. Always use the parking brake when placing and removing the child, or when standing still even for a few moments! Always check that the brake is fully engaged. The wheels of my Doona won't move! What is wrong? Press the green brake release pedal located next to the left wheel to release the breaks. Please note – The brake must always be on when putting the child in or taking him out. Always use the parking brake when placing and removing the child, or when standing still even for a few moments! Always check that the brake is fully engaged. How does the Energy-Absorbing Foam work? Energy-absorbing foam absorbs some of the impact forces that occurs during a crash, keeping your child from absorbing them therefore preventing or minimizing an injury. The foam also acts as a barrier between your child and the seat shell and any other rigid objects such as the vehicle door or window. How does the Doona Anti-rebound Protection feature work? Can I use an inflatable seat belt to install my Doona car seat? Inflatable seat belts are now found in the back seats of some Ford & Lincoln vehicles (starting in 2011) as well as some Mercedes vehicles. Based on an analysis of vehicle seat belt system testing results, the current Ford Motor Company (Ford & Lincoln vehicles) Inflatable seat belt system is approved for use with Doona car seat using a “Lap shoulder belt standard installation”. How safe are the materials Doona is made of? All materials used by Simple Parenting are carefully tested and approved under the most strict American and European standards and the REACH regulation, including SVHC (Substances of Very High Concern). Not only are the materials used free of any hazardous chemicals, they are also tested for their durability and quality to assure the safe and continuous use of the products. Where is the Energy-Absorbing Foam located on the Doona car seat? There are different kinds of absorbing foams located where it is mostly neccesary, inside of the shell and at the head support. Installation and questions on the Doona Bases. ISOFIX is an international standard for safely and easily attaching an infant car seat in vehicles without using the vehicle’s seat belts. Using ISOFIX connectors dramatically reduces installation errors and improves the safety of car seats. Rigid ISOFIX connectors on the car seat base which connect to standard anchor points in the vehicle seat. Reinforced adjustable support leg (also called foot-prop). Some cars made prior to 2006, and all cars made from 2006 are equipped with ISOFIX anchor points. 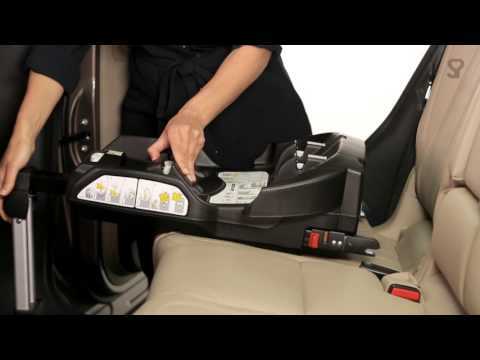 How do I install the ISOFIX base? Can i install the ISOFIX base with the vehicle belt? No. The ISOFIX base can be installed in the car only using the ISOFIX connectors according to the ECE R44 standard requirements. Can I install the Doona ISOFIX base in rear seats with an underfloor storage compartments? You should not install the Doona ISOFIX in rear seats with underfloor storage compartments. Semi-universal approval is when, in addition to the standard requirements, it requires the use of an additional safety or anti-rotation device-foot prop, which may affect compatibility with certain vehicles. It also requires additional testing. My car is not listed in the car fitting list, how do i know if it will fit? Doona is certified as a Universal car seat, and as such it fits all cars that can accommodate a newborn car seat. There might still be cars in which the Doona won’t fit (e.g. super compact sports cars) but if the Doona doesn’t fit neither will other car seats probably. The Fitting List on our website does not pertain to the Doona but only to the Isofix base, which is not sold in the US. Can I install Doona car seat using both the base AND the vehicle seat belt? No. 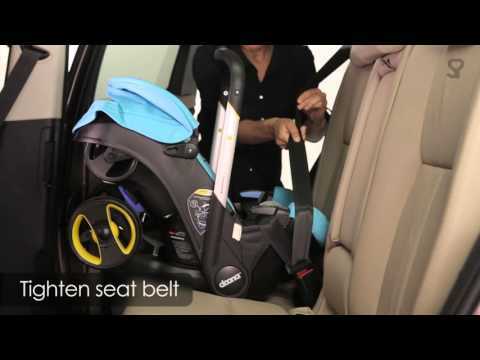 Doona car seat should be installed using only one installation method – either the vehicle’s seat belt or with the base (ISOFIX base in Europe of LATCH Base in the US). Parents should always refer to the user guide for detailed instructions. Is it safer to install the Doona car seat with the base or with the vehicle seat belt? Doona car seat successfully passed all tests using both kinds of installation methods. Installed correctly, both methods are safe. Parents should always refer to the user guide and vehicle owner’s manual to determine the best way to install their child seat for their vehicle and for their child. How to ensure the ISOFIX fit my car? The fitting list is based on information received from the different car manufacturers pertaining to certain dimensions in the different models. Nevertheless, it is important to understand that the Fitting List cannot be considered 100% accurate, and one of the reasons is that there are slight variations even between different models of the same car, and between same models in different countries. If possible, the best way to assure that the Isofix fits a costumer’s car is to verify this at the time of purchase by installing the base in the car. Maintenance and accessories of the Doona. When should I remove the Infant Insert? Once the harness straps feel too tight for your baby, you should first verify that the shoulder straps threaded in the correct height for the baby’s shoulders, make sure that the harness straps, at the back of the Doona, threaded between the Doona body and the metal bar. If the straps still feels too tight, then your baby has outgrown the Infant Insert and you can remove it. Make sure you keep the head support for the protection of your baby. When should I remove the Doona Head Support? Simple Parenting strongly recommend continuing using the Doona Head Support for as long as you keep using the Doona car seat for the protection of your baby. Can I use accessories with the Doona Car Seat? Do not use aftermarket parts or accessories with the Doona Car Seat unless supplied or approved by Simple Parenting for use with the Doona Car Seat. Non regulated aftermarket parts and accessories may impair the performance of the Doona Car Seat in case of a crash. Simple Parenting offer a line of accessories designed for use with Doona car seat, which you may find on our website or at your local distributor. Can I wash the Infant Insert? The Doona Infant Insert can be washed. Before cleaning, check the care label sewn on each item, for washing instructions. Can I wash the Doona seat cover, shoulder pads and canopy? The Doona seat cover, shoulder pads and canopy can be removed for washing. Before cleaning, check the care label sewn on the seat cover, for washing instructions. If the seat cover needs to be replaced at any time, use only an official Doona seat cover because it constitute an integral part of the restraint performance. To clean the shell, you can use a damp cloth. Why should I use the Infant Insert? The Infant Insert is made of baby safe materials. How can I protect my vehicle seat when using Doona? 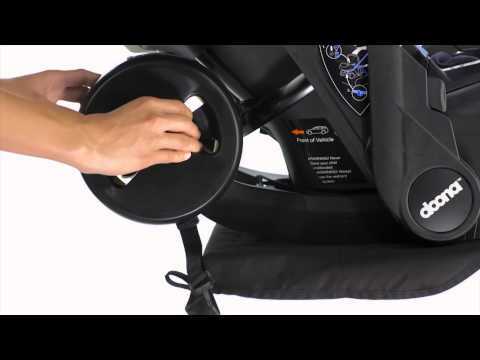 The Doona wheels are designed in a way they do not touch the vehicle seat. Yet, if you wish to ensure the protection of your vehicle seat, the Doona wheel covers were designed just for that. In addition we have design the Vehicle Seat Protector. How can I protect my baby from the rain? How can I protect my baby from insects? Can I hang any diaper bag on the Doona? Do not use bags unless supplied or approved by Simple Parenting for us with the Doona Car Seat. Non regulated accessories may impair the performance of the Doona Car Seat in case of a crash. We have especially designed the Essential bag ( Perfect for carrying your essentials), All Day Bag (Perfect for a full day out) and Snap On Storage Bag (to store your extra stuff). General questions on the Doona. Where can I find the Doona user guide? The user guide is provided with the Doona, located in a designated slot at the back of the car seat. How do I register my Doona and base? Where do I find the model number on my Doona to register my product? Please refer to the sticker at the bottom of the Doona car seat to find the model number. Where do I find the model number on my base? Please refer to the sticker at the bottom of the base to find the model number. Where can I find videos on How To Use the Doona? 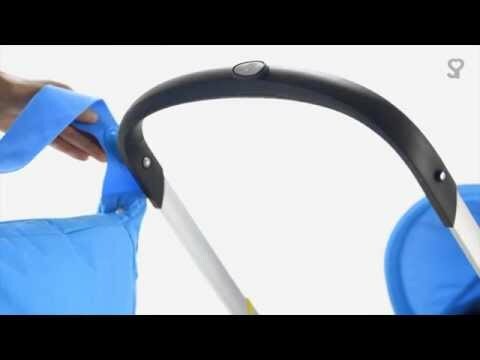 You may find videos of How To Use the Doona as a car seat mode, as on the go mode and the accessories. You may access the videos from our home page at the bottom right corner, or from the support tab at the top menu. How long can I use the Doona car seat or when does it expire? Please refer to the sticker at the bottom of the Doona car seat to determine its recommended useful life. Simple parenting recommends to discontinue the use of a Doona car seat after 6 years from the date of manufacture. How long can I keep using the Doona car seat for my baby? Is Doona certified for air-travel? Doona is certified for air travel without the base. Can the Doona be taken on an airplane? Yes. The Doona is certified for airtravel (without the base). In most aircrafts the Doona can easily pass through the airplane aisle and can be installed on a passenger seats. Make sure to contact the airline company in advance. In case you wish to leave the Doona underneath the airplane you may pack it inside the Doona travel bag (can be purchased at your local retailers). Is Doona small enough to push along the aisle of airplane? Yes – According to both 14 CFR 25.815 (US) and NPA 2008-18 (EU) regulations – the minimum required aisle width in aircraft with more than 20 passengers – is 20 inches in which Doona can easily pass through. How do I install the Doona on an airplane seat? Place Doona on the respective seat on the plane rearward facing position. Folding the arm rests upwards could facilitate the installation of your Doona. Feed both ends of the lap belt through the belt guides of the Doona. Make sure that the belt is not twisted! Now, close the belt buckle and tighten the belt. Make sure to contact the airline company in advance to make sure that you can bring the Doona on board. Can I install the base on an airplane seat? No. The Doona is certified for aircraft without the base. Can I take the Doona on the subway or train? Yes, you may travel with the Doona in a subway or in a train. Make sure that you lock the breaks once you enter the train. To apply the brakes, press the red brake lock pedal located next to the right wheel. To release the brakes, press the green brake release pedal located next to the left wheel. Can the Doona be used on all seats in a car? How can I protect my Doona underneath the airplane? You may pack the Doona inside the Doona travel bag (can be purchased at your local retailers). Can I put the Doona in the overhead compartment of a plane or train? Doona might not fit into most overhead compartment of an aircraft or train. Can I use the Doona in a taxi cab? Yes. The Doona can be installed in a taxi the same as in your car. Where can i find the aircraft approval sticker on the Doona? The aircraft approval sticker is located at the back of the Doona. Check list for correct installation – Doona. Harness straps are not twisted. Properly tighten the harness straps for the protection of your baby. Shoulder straps are in the correct height for your baby’s shoulders. Shoulder straps assembled to the metal plate at the back of the Doona between the metal bar and the seat body. No part should go over the metal bar. Doona installed rear facing – not front facing. Handle is in anti-rebound position. Head support always installed to enhance protection for your baby in case of a side impact. Infant insert removed if baby’s is grown. Shoulder pads are located on the shoulders (not on chest). Check list for correct installation - ISOFIX base. ISOFIX connectors properly installed in the car. ISOFIX support leg rests firmly on the floor of the vehicle. The color indicator should changes from red to green. 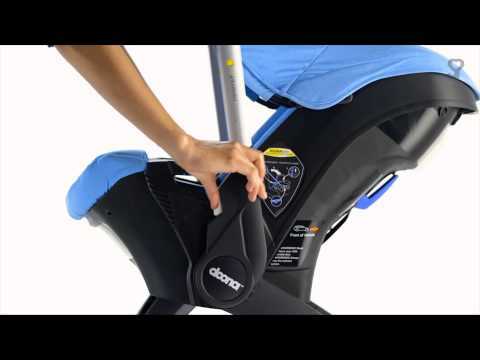 Doona is properly connected to the ISOFIX base (tilt Doona to ensure its connected to the base). Simplicity is embedded in our DNA. In order to simplify the lives of parents and babies, we design smart and simple products. To achieve the most out of our products, please follow these quick tips. Pull the shoulder straps upwards to remove slack from the lap area. When the shoulder straps are adjusted correctly, they go through the shoulder strap slots at shoulder level or slightly below. Place the baby in the Doona™ Car Seat and locate the correct shoulder strap slots for your baby’s height. Then take your baby out of the Doona Car Seat. At the back of the Doona™ Car Seat, disconnect the shoulder straps from the metal plate. Insert the shoulder straps to the correct slots. Reconnect the straps to the metal plate. * Make sure the straps are located between the metal bar and the seat body. No part should go over the metal bar. For your baby’s comfort, be sure to position the shoulder pads over the shoulders area when buckling the Doona harness. The pads are soft and wide, and will distribute the pressure of the harness straps more equally over your baby’s body. Remove the Infant Insert once your baby has grown and the harness is too tight. The insert is intended for newborn babies typically up to 5 kg (11 lbs). Keep using the head support for as long as possible, for enhanced side impact protection. One of Doona’s main differentiators, when it comes to safety in the car, is its handle which serves as an extremely effective anti-rebound bar. In the car, always rotate handle against seat back. Ensure that the shoulder straps are assembled onto the metal plate so that all straps are located between the metal bar and the seat body. No part should go over the metal bar. Doona™ achieved excellent results in side-impact collision tests. Due to its unique design, Doona’s wheels and double wall structure absorb a significant portion of the energy transmitted during a side impact collision. 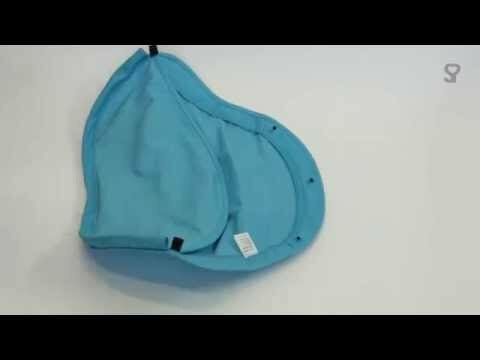 The Doona™ Head Support was designed to further enhance this protection, as well as provide support and comfort for the baby. In addition, its outer surface is made of Bamboo Charcoal Fiber textile, which is Anti-bacterial, Hypoallergenic and Humidity & thermal regulating, and has an Anti-slip back surface. Keep the head support as long as possible for the protection of your baby. Specifically designed for newborn babies, the Doona Infant Insert provides young babies with the highest levels of safety and comfort. Developed alongside global engineering, safety and medical experts, the insert supports your baby’s posture, by mimicking a natural position, thus granting parents and babies the freedom to travel together. Additional padding adjusted for newborn infants. Bamboo Charcoal Fibre textile, which is Anti-bacterial, Hypoallergenic and Humidity & thermal regulating. Rotate the handle to its upright position. Press down the small top button, and while it is pressed down, push the entire release button towards the vehicle seat. While pressing the Doona release button, slightly tilt the Doona toward your body. Remove your hand from the button and lift the Doona outside of the car. In the unlikely event that you may need to replace or repair any part of your Doona™, please contact our customer services where we have a full range of replacements available. Please note that all repairs must be carried out by our trained engineers at our head office and repair centre in Manchester. For general or order enquiries, please contact customer services on 0161 702 5057 or customerservice@cuddleco.co.uk.